The call for proposals is scheduled to close March 8th, 2019 5:00 pm Pacific Time. Proposal will be reviewed and applicants notified by the end of March. Presenters will need to register to attend the conference as part of the final acceptance. 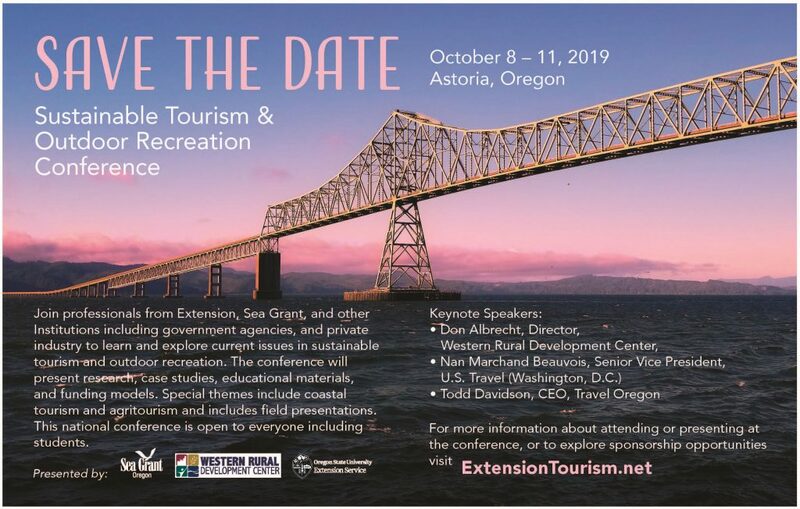 The 2019 Sustainable Tourism & Outdoor Recreation Conference, organized by National Extension Tourism Design Team (NET), will be held in Astoria, Oregon, October 8-11, 2019. This is an outstanding opportunity for Extension professionals, academic faculty, and others working in the broad area of tourism and recreation, including tourism service providers and businesses, to share programs, initiatives, research, and success stories, and network with other professionals. The mission of the National Extension Tourism (NET) Design Team is to enhance Extension tourism programs nationally by providing relevant information, useful resources, and networking opportunities for Extension professionals and others working in the broad area of tourism and recreation. 1) Make use of environmental resources as a key element in tourism development, while maintaining essential ecological processes and helping to conserve natural heritage and biodiversity. 3) Ensure viable, long-term economic operations, provide socio-economic benefits to stakeholders that are fairly distributed, including stable employment and income-earning opportunities. Reference: Making Tourism More Sustainable – A Guide for Policy Makers, UNEP and UNWTO, 2005, p.11-12. Presentations are invited that address one or more of these pillars through research, practice, programming or policy. Presentations can share applications, case examples or programs across a breadth of areas including agritourism, coastal tourism, community tourism, outdoor recreation, tourism leadership, emerging trends or other topics related to tourism and outdoor recreation. Workshop Presentation (60 minutes) – Workshops should not just be extended oral presentations, as these should include an interactive component providing hands-on experiential opportunities for professional development. A limited number of workshops will be accepted. Presenters are encouraged to submit more than one presentation proposal, if interested. Specific questions or inquiries regarding proposal submissions may be addressed to Doug Arbogast, 2019 Conference Program Chair; doug.arbogast@mail.wvu.edu; (304) 293-8686.